As Director of Programs at CRA, Erik is involved with a broad range of programs focusing on human resources, community-building, and connecting CRA with the other organizations advancing computer science and engineering. He supports several CRA committees such as the Committee on the Status of Women in Computing Research (CRA-W), the CRA Deans Group, and others. Before joining CRA, Erik worked to advance computer science education through his service as an Albert Einstein Distinguished Educator Fellow within the Directorate for Computer & Information Science & Engineering at the National Science Foundation. As part of the Education and Workforce Program at NSF, which included initiatives such as Broadening Participation in Computing, and the Computing Education for the 21st Century, Erik has been actively working to engage and retain students from underrepresented groups in computer science. As Program Associate, Daniela supports CRA and CRA-W program activities with administrative and logistical matters such as planning meetings, workshops, outreach activities, and committee support. 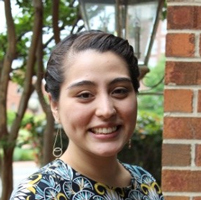 Daniela emigrated from Venezuela in 2007, and holds a Bachelor’s Degree in Political Science and Government and a minor in Education from Florida State University. In her spare time, Daniela enjoys watching football and painting with acrylics.